Why should you buy a sewing machine? Whether you are a self-taught DIYer or a professional, a good sewing machine that can handle most of your stitching requirements can be a blessing. High-end machines cater to a wide range of requirements and can give just the right touch of professionalism to your work. To make the best of your designing talent, you should choose the best sewing machine. What should you consider before buying a sewing machine? There are different types of sewing machines available on e-commerce sites. 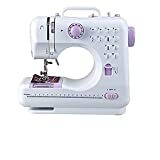 After going through thousands of sewing machine reviews, we have listed some points, which will help you buy the right one, out of the multiple options on the e-commerce sites. Make a brief list of your requirements: Chalk out your expectations from the machine, and compare it with the model you are planning to buy. There is no point spending a lot on additional features that you don’t plan to use. Select a model that can easily perform all the stitches that you regularly use, plus a few more, if you do not want to be looking for an upgrade anytime soon. Check the attachments: Look for a machine that comes with all the necessary attachments that you use regularly. If any of the desired attachments are not included with the model you have selected, then consider the cost of purchasing the attachments separately. Ensure high functionality: Look for a machine that can wind bobbins, as this can save you a lot of time. Check to ensure that the model has a twin-needle function--you may need it frequently. Opt for a quiet machine: Noise from the sewing machine can become irritating after a while. Look for models that are quieter and smoother.